To the crown of Karkonosze (Giant Mountains) via Dolina Łomniczki (Łomniczka Valley). 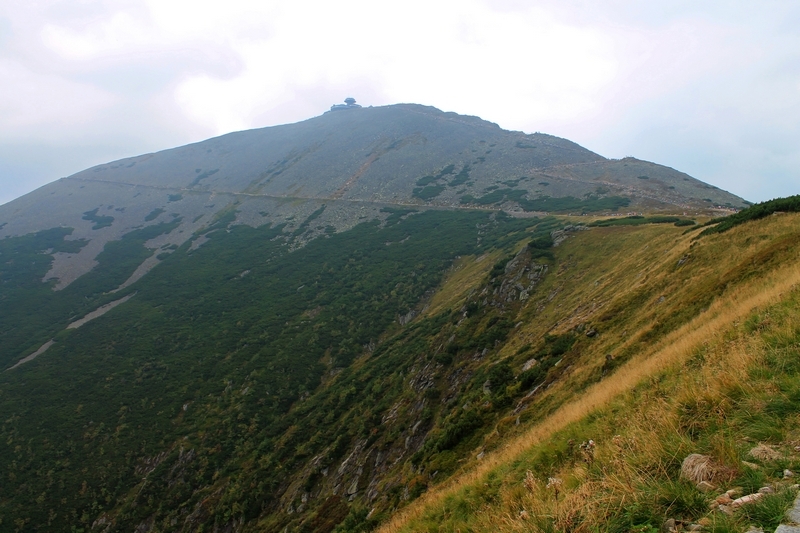 The shortest way to get to the Śnieżka peak from Karpacz goes via the Kocioł Łomniczki (Łomniczka Cirque). Get off the bus on the Bialy Jar bus stop and follow red trail signs. The air is very fresh and chilly in the woods and you can really feel close to nature here. What season? From late spring until early autumn, unless the snow is still/already there. Starting point: Karpacz, Biały Jar Bus Stop. The distance from Nad Łomniczką Shelter to top of Snowy Summit is challenging. In addition, on a top of the Snowy Summit the wind can be very strong therefore we leave this decision up to you. If you decide to take this walk with your child, we recommend using a baby carrier. 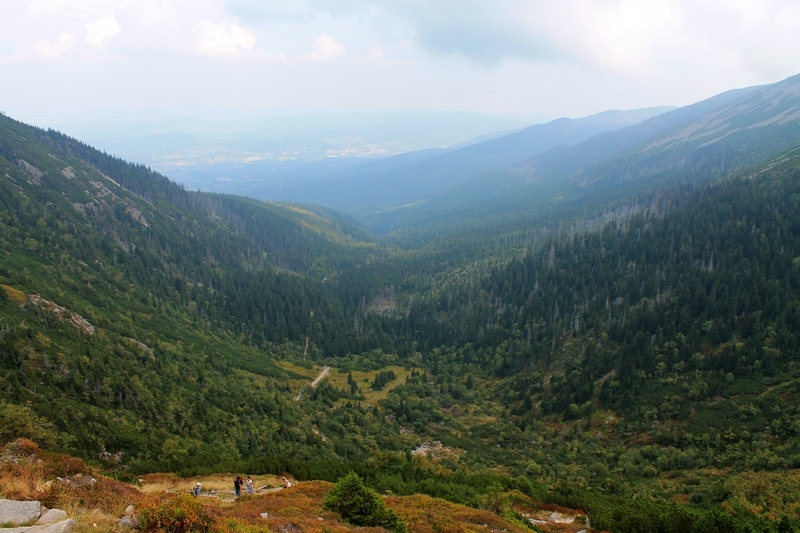 The 50 minute hike among the trees should take you to Nad Łomniczką shelter (1002m). The lodging doesn't offer overnight stays, however, the biggest attraction of this place is the delicious Polish food. There is no tourist who would not be delighted with their famous blueberry pancakes. 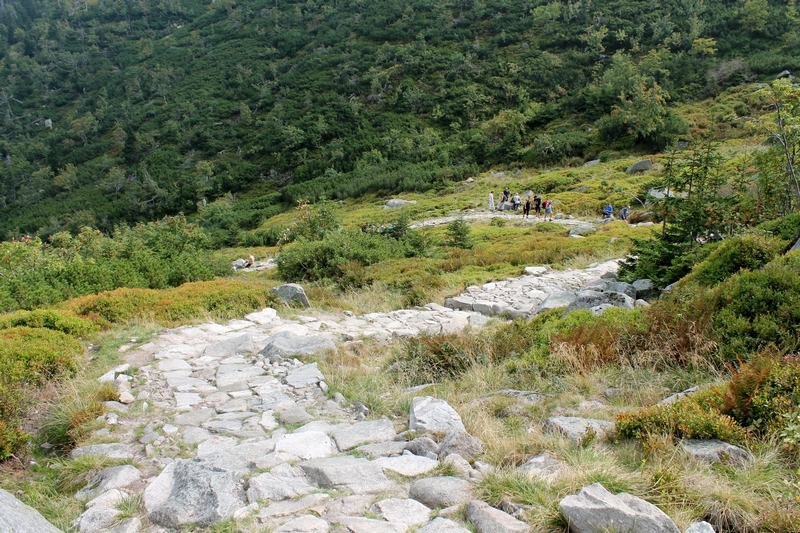 When you are ready, continue your trek up the hill along Łomniczka brook. At a height of about 1100 m, you will leave the woods behind. If the weather is nice, the peak of Śnieżka should already be visible. The next attraction is set on the western part of Kocioł Łomniczki. It is 300m long system of cascades called Wodospad Łomniczki (Łomniczka Waterfall). 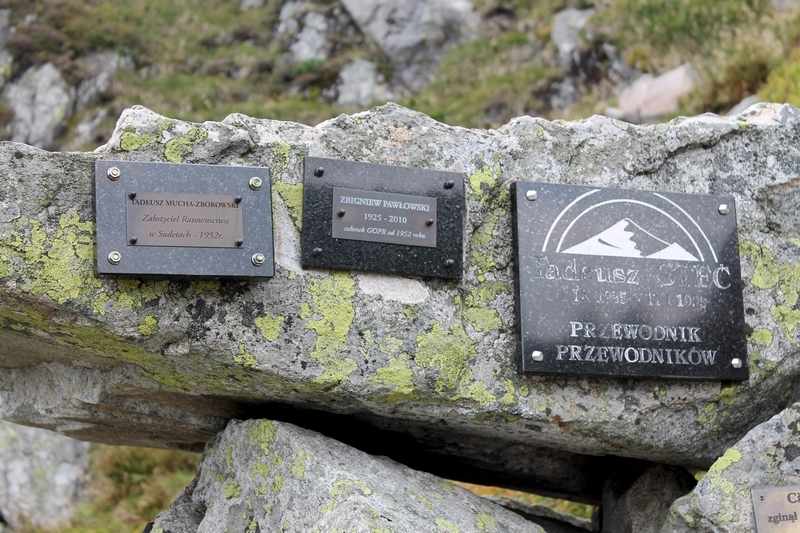 The next stop brings about a lot of emotions, as it is a symbolic cemetery dedicated to all the people who died in these mountains and whose death had an impact on a development of tourism in Karkonosze (Giant Mountains) . The cemetery was created in 1985 at the height of 1300 m.a.s.l and the metal cross of 130kg in weight and 2,4m high was erected on the hillside. 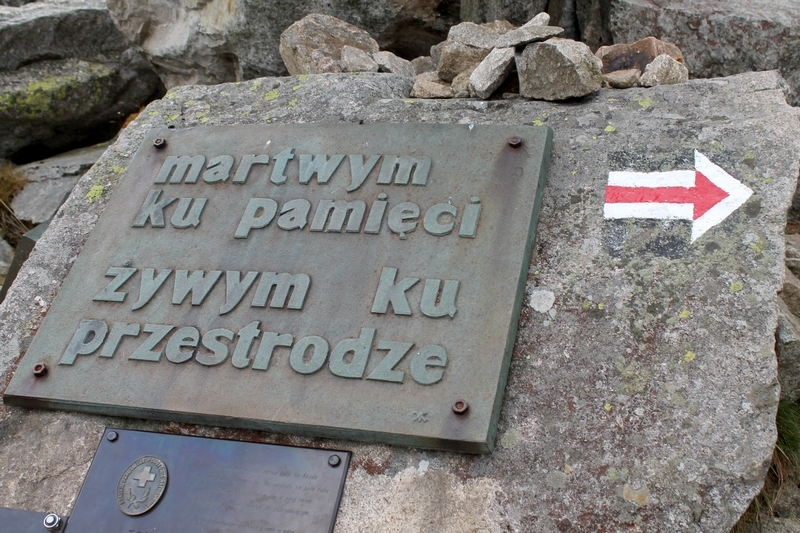 If you look closer, you will find a Polish inscription: “Martwym ku pamięci, żywym ku przestrodze” which translates to: in memory of the departed, in caution to the living. The place reminds us about the unrestrained power of nature and the utmost respect it should be treated with. The intent of the inscription is for most tourists from here to move forward with caution all the way up to the nearest shelter which is Dom Śląski (Silesian House, www.domslaski.pl). Równia pod Śnieżką (Plateau under Śnieżka) provides great views over Polish and Czech highlands. Gazing at the Polish side the entire panorama of the Jelenia Góra Valley is in sight. In the opposite direction you will see extraordinary parts of Czech Karkonosze (Giant Mountains) with Úpská Jáma in the foreground. 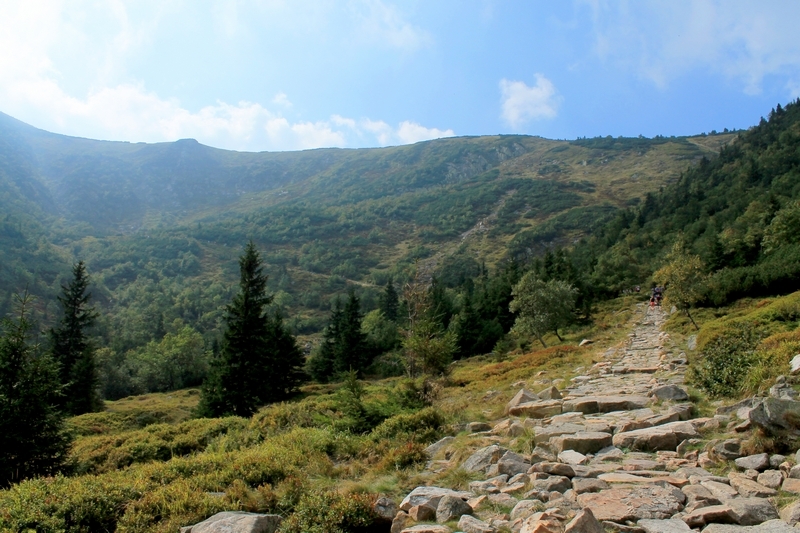 Since the previous part of the hike is quite steep, you may want to choose a less demanding route along the blue trail that circles the Śnieżka cone. Once the blue trail joins with the red one, follow the latter's markers to the top of the mountain. This part of Giant Mountains is very famous, and therefore crowded at the summer time. If possible, chose the week day for the hike. In addition, be aware that in a peak season GOPR recommends the red trail to get to the top of Snowy Summit and the blue one to go downhill to Dom Śląski (Silesian House) shelter. Please follow this rule as it will prevent a walk against the traffic. Whenever you are ready to go down, begin descending along the red trail that starts on the opposite side of the top from the place you arrived to. It will lead you back to Dom Śląski shelter. Pass it by and travel behind the red signs for about 85 minutes. If the visibility is good, you should be able to see 2 beautiful lakes just below. 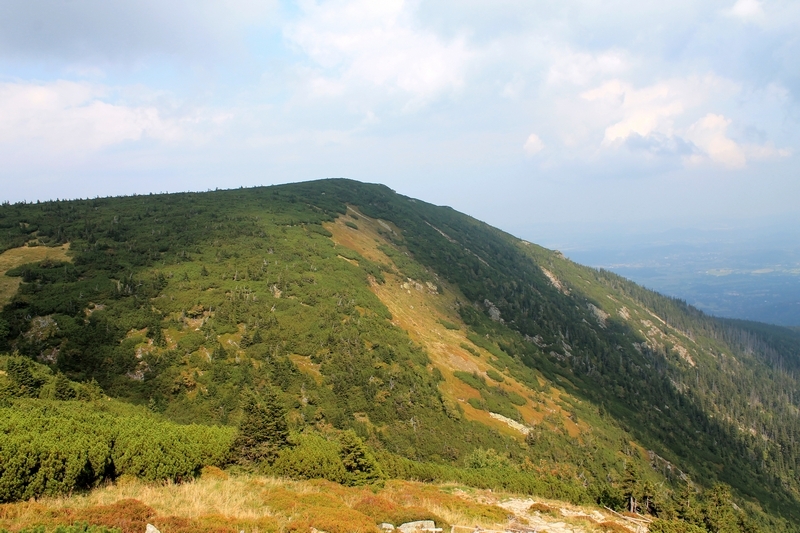 It is a well-known and easily recognized view on the Polish side of Karkonosze (Giant Mountains). 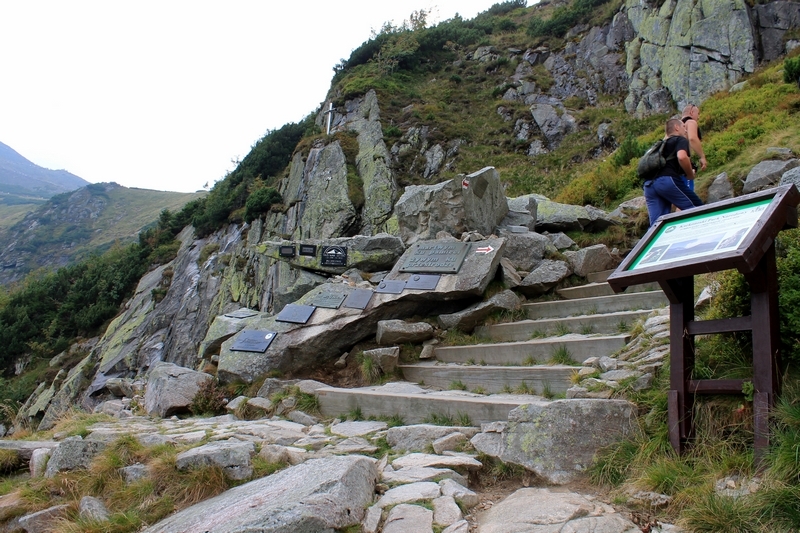 The next checkpoint is Słoneczniki rocks (Sunflowers, 1423 m.a.s.l.). If you look at them from a particular perspective you will notice that one of the pillars resembles a man. 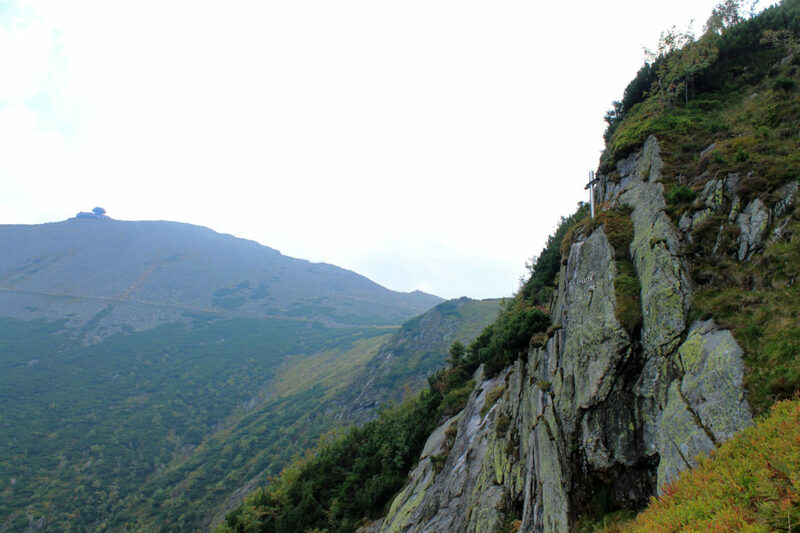 Behind the rocks there is a yellow trail among dwarf mountain pine that links Słoneczniki rocks and Pielgrzymy rocks (Pilgrims, 1204 m.a.s.l.). The second ones are a magnificent stone formations made of granite with a height even up to 25m. You can have a break in the shade of tall Pielgrzymy (Glade). From now on, follow the green trail called Droga Bronka Czecha (Bronek Czech's Way) which ends at the Bialy Jar bus stop.